BioWare may only be finishing up the final touches to Anthem game before its release on February 22, but a new industry rumour suggests there's an appetite within the famed studio to return to a galaxy far, far away. Before the likes of Mass Effect and Dragon Age ate up its development schedule, BioWare was famous for its Star Wars: Knights of the Old Republic RPG series, the last we saw of which was the 2011 MMO spin-off, Star Wars: The Old Republic, made (and still being looked after) by BioWare Austin. Following Kotaku's report that EA had cancelled another big, single-player Star Wars game (which the publisher then confirmed a day later), the author, Jason Schreier responded to someone's tweet about the possibility of a new Knights of the Old Republic game in the future. According to him, BioWare has repeatedly attempted to revive its revered Star Wars game series under EA, but have had "no luck" in doing so, though it's unclear as to why. "They've tried to make it happen", said Schreier, "more than once from what I've heard", but he didn't divulge any further details about the situation. 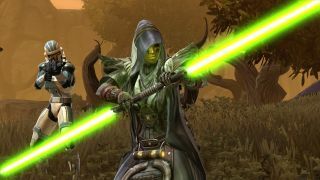 Naturally, the internet's now assuming that BioWare has pitched a new Knights of the Old Republic RPG to EA, only to be turned down in light of the publisher's increasing pivot to online, service-based experiences. Sadly, we don't (and probably never will) know the truth about what happened, but here's hoping Anthem finds enough success to allow BioWare to continue making the games it really wants to make. While we twiddle our thumbs waiting for a new KotOR game, what are the best MMORPGs to play in the meantime?